Another landmark of Nonconformity in Birmingham will disappear shortly. Cherry Street Wesleyan Chapel, which was acquired by the Corporation 10 years ago, but which has up to the present continued to break the line of Corporation Street, and afford a somewhat shabby contrast to the handsome buildings which have sprung up in the new thoroughfare, is at length to succumb to the march of improvement, for its frontage lies athwart the course of the new street which is to be made between Corporation Street and the bottom of Bull Street. The opening of Cherry Street Chapel, by John Wesley, in 1782, marked the turning point in the fortunes of Methodism in Birmingham, for the migration of the congregation from the dingy old playhouse at Moor Street to a place of worship in a central portion of the town brought the Wesleyans from the partial obscurity they had hitherto occupied into the front rank of local Nonconformity. The next important stage in the progress of the Wesleyan body in Birmingham is marked by the ministry of the Rev. Dr. Taft, who was superintendent of the circuit in the year 1823. The question of enlarging Cherry Street Chapel had been often debated by the local leaders, but it was not till Dr. Taft took the matter in hand that the various difficulties that had hindered the work were overcome. The enlargement, which was practically a rebuilding, was completed, at a cost of £6000., in 1823, since which time there has been no structural alteration in the chapel. On January 30th in the following year Dr. Taft died, his term of superintendency at Birmingham not having expired. He was buried in a vault in the middle aisle of the chapel, in front of the pulpit. A tablet behind the pulpit records that Dr. Taft was "for twenty-two years a minister amongst the Wesleyan Methodists, during which period he distinguished himself in many places by his piety, benevolence, and indefatigable zeal. He was the chief instrument in effecting the enlargement of this chapel, which, having seen accomplished, he soon after fell asleep in Jesus." The Corporation have arranged for the transfer of Dr. Taft's remains to one of the catacombs at the General Cemetery, Key Hill, under the direction of Dr. Melson (Dr. Taft's nephew) and a committee of the trustees. Another interesting monument in the chapel is a tablet to the memory of the Rev. John Hewgill Bumby, who, after having ministered in the Birmingham circuit, went to New Zealand as a missionary, and was drowned by the upsetting of a canoe. Both tablets will find a place on the walls of the new home of the society. The schools adjoining the chapel were erected in the year 1855 by Mr Clark, of Camp Hill. They took the place of the old schools on the opposite side of the street which have now for many years been occupied as a printing establishment. The chapel and schools occupy nearly 800 square yards. The chapel is 81ft. long, by 69ft. wide, and will hold about 1,200 worshippers, though on memorable occasions as many as 1,500 have been assembled. The uncertainty as to the intentions of the Corporation with regard to the site of the chapel has had a somewhat paralysing effect on the operations of the Cherry Street Society. There is, however, reason to believe, that the removal which is now about to be effected will be signalised by a further advance on the part of this branch of what is now one of the most prosperous and most active denominations of Nonconformists in Birmingham. 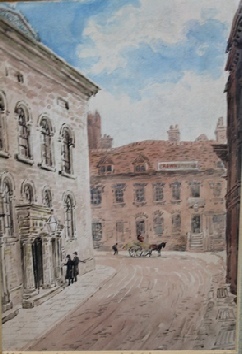 The new chapel will be erected further down Corporation Street, and it is intended that it shall be worthy of its surroundings, of the association of its predecessor and the local and general importance of the Wesleyan body. The demolition of Cherry Street Chapel will take place in about a month. During the next three weeks the congregation will take a farewell of the old place in a series of special services, in which the president of the Conference (the Rev. Richard Roberts), Dr. Melson, and other well-known Methodists will take part.